Lifting a real estate company out of individual spreadsheets into collaborative systems is a very different kind of trip than a holiday voyage to Koh Samui, but mapping out the steps in the process and knowing what results you need are no less critical to having a successful experience. And for companies managing growing portfolios of real estate assets and empowering teams accustomed to getting instant updates on their smartphones, there are benefits to be gained in transparent information sharing, efficiency and automated reporting that come from documented processes and cloud-based systems. For real estate companies in Asia, many of them are starting their journey toward mining the data from their team activities and customer experience with systems that look much the same as what they had been using in the 1990s. This can put property firms at a disadvantage as they expand into new markets or try to ramp up growth. Devine indicates that that while systems like Yardi’s, which allow real estate firms to manage their leasing, track building maintenance and link their financial reporting directly to the front end of their businesses, are built by teams of programmers, implementing them does not require technical knowledge. “The key to getting your business online is having a clear understanding of how each step of each process works and being able to map those steps out,” Devine said. After having helped scores of Asian real estate companies go online, the 25-year property industry veteran sees more adoption of online systems as companies increasingly compete in a region where investment yields are compressing and capital values are rising. For those companies that have already put aside the batteries of spreadsheets on shared drives, and emailing attachments around the network, the biggest benefit can be getting a clearer picture of their financial performance, and getting that information faster. For office landlords that can mean a clearer picture of the time from initial client inquiry to a lease signing and easy access to information on lease maturities to ensure that tenants renew. Managers of retail assets where tenants may conduct thousands of transactions a day can get a clear floor plan based picture of customer traffic in different parts of the facility without spending weeks gathering data and crunching numbers. While tech giants are pushing the envelope of artificial intelligence and self-driving cars, companies don’t have to become giants of big data to improve their efficiency through online systems. 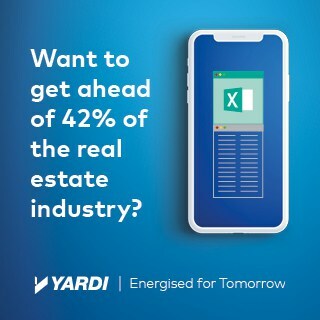 A 2017 survey of real estate companies in Asia by Mingtiandi and Yardi found that 42 percent of respondents were still managing their sales, leasing and property management in Excel. “You can manage your business on a spreadsheet if you want to,” Devine commented, “But it’s prone to more risk than through a single connected solution, as you have multiple points where the same data is being entered – rather than information sharing being streamlined. It also means things are slower, and your people are spending more time doing the back end process, than looking at how to make meaningful decisions based on accurate, timely information. This sponsored feature is contributed by Yardi. To find out more about the company and its services, please click here.